What Does Code P0042 Mean? Modern vehicles use both an upstream and downstream oxygen sensor. The upstream oxygen sensor (O2S) is located ahead of the catalytic converter. It is used to determine the concentration of oxygen in the exhaust gas. This information is used by the PCM to control the engine air/fuel mixture. The sensor compares amount of oxygen in the exhaust to the surrounding air (there is an opening in the sensor that is exposed to the atmosphere). It generates a corresponding voltage which is transmitted to the PCM. The PCM then controls injector pulse based on this value. 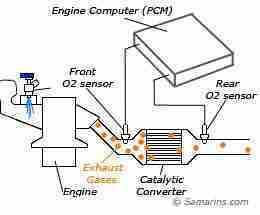 The downstream oxygen sensor is located behind the catalytic converter and is used to check converter efficiency. It does so by checking the oxygen content of the exhaust after it leaves the converter. For this reason, downstream O2 sensors are known as catalyst monitors. Modern vehicles use heated oxygen sensors (HO2S). These sensors contain a heating element that brings the sensor to operating temperature faster. This allows the PCM to use the signals input sooner, for more precise fuel control and reduced emissions. The heater circuit is energized through a relay that closes when the engine is cranked. The PCM monitors the heater circuit and will turn on the check engine light if it finds a problem. Code P0042 stands for HO2S heater Performance Bank 1 Sensor 3. This indicates the PCM has detected a problem with heater circuit of the downstream oxygen sensor. Bank 1 refers to the side of the engine that has the #1 cylinder. Bank 2 is the opposite side of the engine. If you’ve got a four-cylinder, there will only be one bank. The related code for the other bank is P0062 HO2S Heater Performance Bank 2 Sensor 3. This indicates the PCM has detected a problem with the bank 2 downstream oxygen sensor heater. What are the common causes of code P0042 ? What are the symptoms of code P0042 ? The only thing you will notice is an illuminated check engine light on your dashboard. If you live in a place that requires emissions testing, the check engine light will cause you to fail. How do you troubleshoot code P0042 ? 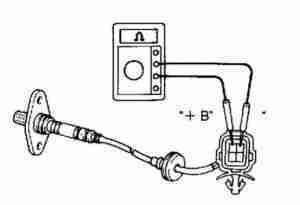 This code can only be caused by problems in O2 sensor heater circuit, or by the sensor itself. Typically, heated O2 sensors have four wires – two of which go to the heater circuit and two that are power and ground for the sensor. In this case study, we are only concerned with the heater circuit. 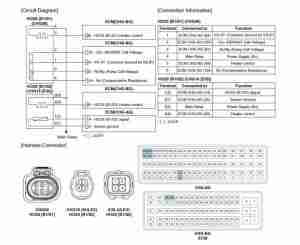 You’ll want to obtain the wiring diagram from your vehicle to be certain you are testing the correct wires. First, you want to disconnect the O2 sensor connector and test the heater circuit for power and ground. You can do this using a digital multimeter. By consulting the wiring diagram for you vehicle, determine which pin on the connector is power and which is ground. Set your multimeter to the volts setting. Touching the black multimeter lead to ground and the other to the power feed on the connector, you should see a reading that’s close to battery voltage. If not, you have a problem with the O2 sensor power supply. You’ll need to consult the power side of the wiring diagram to find where the circuit fault lies. To test the ground side of the circuit, connect the red multimeter lead to the battery positive terminal and the black lead to ground. Once again, you should see a reading of about 12 volts. If not, you’ll need to consult the ground side of the wiring diagram to find where the circuit fault lies. If you’ve got good power and ground, the next thing to do is check the sensor heating element for either high resistance or an open circuit. You’ll do this using your digital multimeter. Set your meter to the ohms setting. Then, connect your meter leads to both of the heater circuit pins on the sensor side of the connector. Consult the service information to see if the resistance value on your meter is within specification. If not, the heating element inside the sensor has high resistance and the sensor should be replaced. If you get a reading that says OL on your meter while performing this test, the heating element has an open circuit. Once again, in this case, the sensor should be replaced. None found. Ask a question about P0042.